make it perfect: .Recipe Monday - Guest Blogger. .Recipe Monday - Guest Blogger. 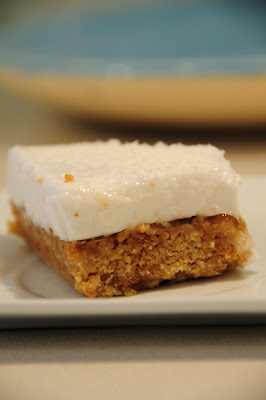 Okay so this RETRO slice is yummy, easy, feeds many and is cheap to make. Apparently it's a recipe that's been around for a long time and I reckon it should make a comeback. Maya didn't believe me that we were making "marshmallows" until she tasted it. Melt butter and pour over dry ingredients.Mix well and press into slice tin. Bake in a moderate oven for 15-20 mins until just brown (not too brown!). Allow the base to cool. While the base is cooling, bring the water, sugar, gelatin and vanilla to the boil, and boil for 3 mins.Allow the marshmallow mixture to cool in the fridge before beating until light and fluffy. Pour over base and allow to set in the fridge. Use baking paper so the slice can be lifted out easily. We sprinkled coconut over the top. Marshmallow can be dyed any colour. YUM-O I agree... this is one of the tastiest slices ever..... thanx for the reminder. This looks delicious - I may have to try this recipe! Yummo...I'm going to make this with my children tomorrow! Looks delish. We did end up making this slice...it was really yummy. I used pink in my icing...to keep my daughter happy. ...snickers and porridge...that sounds really good!